Google Docs has added support to view ZIP and RAR files in their Google Docs Viewer. The viewing is extended to nested ZIP and RAR archives that are embedded inside other archives. Files in the archive, the file types, and the size of those files will be shown during viewing. 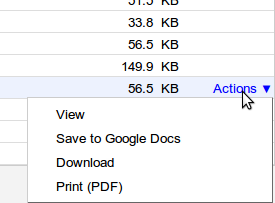 On top of that, Google Docs has added support to save, download and print files. To test this feature, Google Docs has put up a ZIP file.